Product prices and availability are accurate as of 2019-04-17 23:58:56 UTC and are subject to change. Any price and availability information displayed on http://www.amazon.com/ at the time of purchase will apply to the purchase of this product. 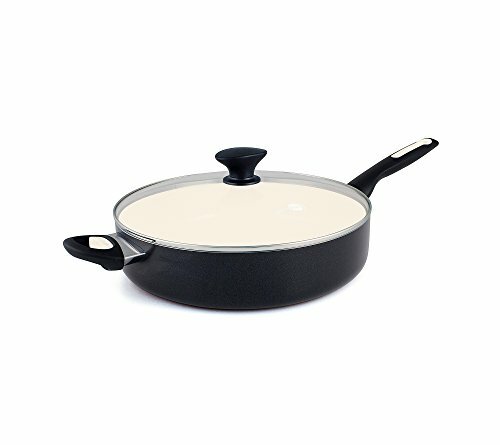 This Ceramic Saute Pan is a really wonderful product to have in your home, especially if you are cooking the Dog Cancer Diet. The ceramic coating ensures that you don't have to use a lot of fat to keep your food from sticking to the bottom-- very little fat is recommended in the diet. Web exclusive! Experience cooking convenience when you have a GreenPan Rio ceramic 5-qt. saute pan. Liquids won't spill out thanks to high sides and the pan's large surface area makes it ideal for braising or searing meat, as well as reducing sauces. Other design details include a ceramic nonstick interior, an ergonomic stay-cool handle and optimal heat distribution. This 5-quart saute pan can also be placed in the dishwasher for quick and easy cleanup.